Kai Nui - Great Location and Value in Desirable Poipu Kai! Perfect place to enjoy your meals in paradise! Are you still sandy after your beach day? Rinse off in the outdoor shower! 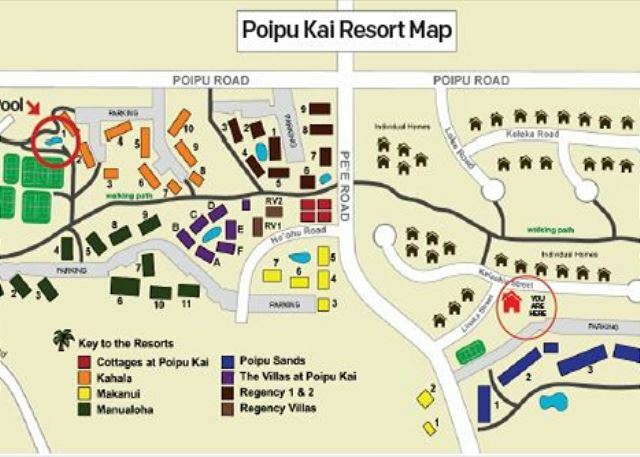 Complimentary access to Poipu Kai Resort shared pool & hot tub just a short 5-8 minute walk away from home! 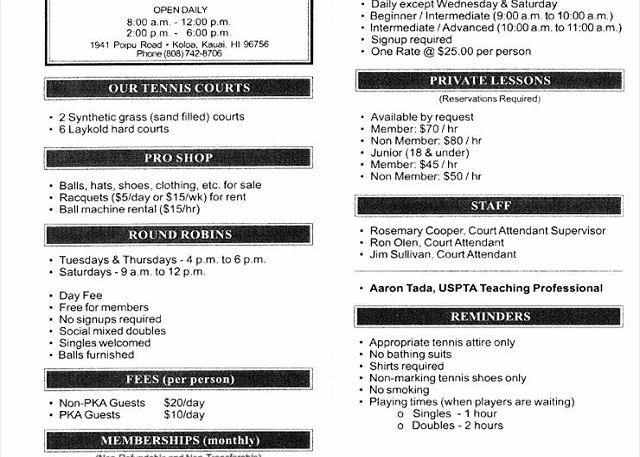 Poipu Kai Resort shared tennis courts (additional rates apply) just a short 5-8 minute walk from home! Plenty of room to spread out and enjoy the tropical sounds and trade winds upstairs on the second floor. Kitchen on left and master bedroom entry door off of kitchen on right in background. Upstairs living area with screened in lanai in background with additional queen AND full bed (double bed not shown in picture). Enjoy your own private screened in lanai off of the master bedroom. King bed. Enjoy a private screened in lanai that includes a full sized bed for your little ones! Queen size bed in main bedroom area. Private bathroom. Located on the first floor with private lanai entry. Queen bed. Private bathroom. Kai Nui is a stylish 2,800 sq. ft., 3 bedroom, 3 bath home located within the Lanai Villas section of the beautiful Poipu Kai Resort Community. Located perfectly for those looking to walk to the beach or all of the other Poipu Kai amenities. While you cannot see the ocean horizon, you can certainly hear the sounds of the crashing surf in the distance, bringing a peaceful tranquility to the ambiance throughout. This home is the perfect family retreat and perfect for couples and friends vacationing together as it offers some versatile bedding configurations, including two screened in sleeping porches that allows you to enjoy the sounds and fragrances of our island tropics. The open aired living room has windows all around creating lots of natural light and allowing for breezes to blow through to help keep things cool. The kitchen is newly remodeled and will make your meal preparations a dream. Built for privacy, the master bedroom is located upstairs and the 2 guest rooms are located on the lower level, each with their own bathrooms. Please note: Poipu Kai community pool will be CLOSED for renovations starting 4/29/19 for up to 3 to 4 months.